Though many expected stronger employment gains in January, businesses expanded payrolls modestly for the month. The subdued hiring trends starkly contrast with declining layoffs and tightened initial unemployment claims that reinforce that the job market is on sound footing. Whether the poor weather that brought much of the country to a standstill in January significantly impacted job creation or the employment market is truly entering a patch of slower growth remains a subject of debate, but numerous indicators point to rising economic momentum that should support increased hiring. U.S. employers created 142,000 private-sector positions in January. Combined with a loss of 29,000 government jobs, payrolls expanded a net 113,000 positions. Job gains in January were widespread, but fell short of expectations. Rising consumer spending supported the addition of 14,800 jobs at bars and restaurants. Residential development in warm-weather states also built momentum, underpinning a gain of 48,000 construction jobs, the largest monthly increase in nearly seven years. Several office-using employers are also increasing staff to handle higher work volumes, with professional and business services payrolls expanding by 36,000 workers in January. Financial services, and education and health services pared payrolls during the month, while information employment was flat. Employment in 2013 was revised upward to more than 2.3 million jobs for the year. With the increase, 90 percent of all the positions lost during the recession have been recovered, while the private sector has recovered 97 percent of the jobs lost. A rise in oil and gas production across the country has supported hiring in the natural resources and mining sector, lifting the total employed in the sector beyond its pre-recession peak. Education and health services, and leisure and hospitality have also surpassed their pre-recession peak employment levels. 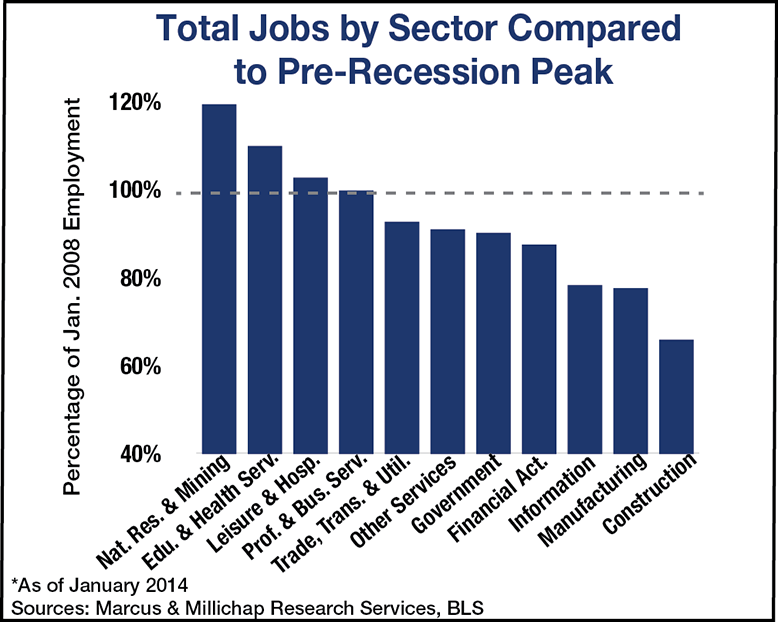 Two sectors that remain well-below peak employment levels are construction and manufacturing. Commercial and residential development remains well below the levels set in the last expansion, while the recovered manufacturing sector has increased automation to ease staffing needs. Job creation continues to support rising retail spending and has underpinned the retail property sector. Behind improving space demand, national retail vacancy declined 40 basis points last year to 7.2 percent, the lowest level in more than five years. A combination of additional store openings by retailers and limited construction of multi-tenant properties will shave an additional 70 basis points off vacancy this year and support a 2.5 percent jump in rents. Demand for rental housing remains strong. Last year, the national apartment vacancy ticked down 10 basis points to 5 percent and the average effective rent advanced a healthy 3.5 percent. Supply-side pressures will increase in 2014 as developers move swiftly to capture unmet demand. An increase in completions to 215,000 units will underpin a rise in vacancy to 5.1 percent by year end. This entry was written by marcusmillichap, posted on February 7, 2014 at 10:15 pm, filed under Uncategorized and tagged CRE. Bookmark the permalink. Follow any comments here with the RSS feed for this post. Post a comment or leave a trackback: Trackback URL.